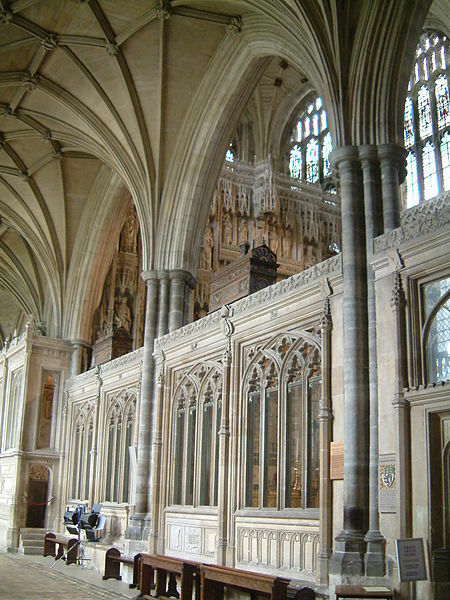 For the past 300 years, anyone who has visited Winchester Cathedral could see, high atop the choir screen, 6 beautifully carved, wooden mortuary chests containing the remains of Anglo-Saxon royalty and ecclesiastics, dating back to A.D. 786. 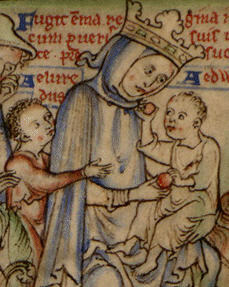 One of them, according to the inscription on the front, contains the bones of King Cnut and his queen, Emma of Normandy. There has always been some question, however, as to how many skeletons are in each chest, and to whom they belong. Now, however, the cathedral is preparing to examine the contents of the mortuary chests, and preliminary research has already begun. Here’s the background: Cnut and Emma were originally buried in the crypt of the Old Minster at Winchester, but in A.D.1158 the remains of all the royals and saints in the ancient crypt were removed and placed in lead coffins inside the new, Norman cathedral. Several hundred years later, in about A.D.1525, these lead coffins were replaced by eight wooden chests which were set atop the choir screen. On 14 December, 1642, in the midst of the English Civil War, Winchester was attacked and the Roundheads ransacked the cathedral. A number of the mortuary chests were pulled down and the bones scattered across the cathedral floor. When the bones were re-collected, they were placed in six chests, not the original eight. Since then, although the chests have been opened and the bones within examined and cleaned, no effort has been made to determine if all the original bones are still there, and if, in fact, the bones that lie within the mortuary chests belong to the royals whose names are engraved upon each box. The project that has now begun in Winchester will conduct research on the DNA of the bones within the six chests. This should, at the very least, enable scientists to identify and separate the skeletal remains. It raises other intriguing possibilities as well. If the scientists find a full or nearly full skeleton that they can attribute to Emma, what will it tell us about her? From previous studies of this kind scientists have been able to measure height, have been able to determine diet, could even say whether the individual spent a great deal of time astride a horse and, in some cases, speculate as to the cause of death. The answers to such questions would shed welcome light on the life of this fascinating woman. 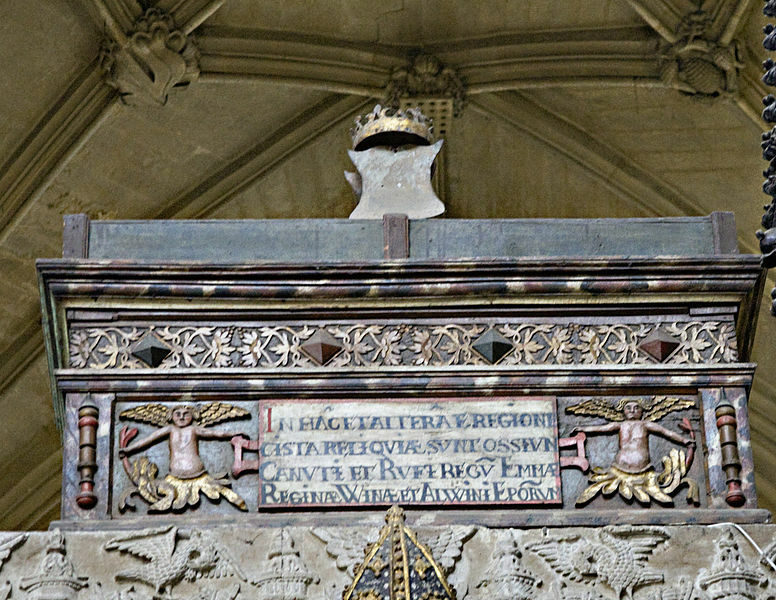 I have visited Winchester Cathedral and have gazed for some time at the mortuary chest that bears the inscription EMMA REGINÆ. Now, for the time being, it is locked away in the cathedral’s Lady Chapel. 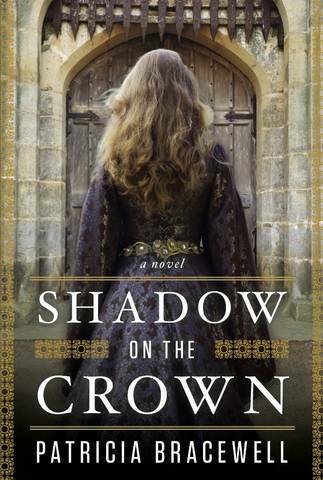 Hopefully its secrets will soon be unlocked, and I for one will be eager to learn what they can tell us about one of England’s most remarkable queens. The history of this just makes my heart yearn to see this place. Every time I read about someone in the past reeking havoc with these beautiful places, I just want to zap myself back in time and strangle them. This is amazing. I’ll be interested to learn what they find out about the bones. If there are skulls in these chests, can they be laser scanned and a facial reconstruction carried out? That would be excellent, as there are no life-like portraits from this turbulent period in history. Steve, there are definitely skulls in the chests. I am absolutely no expert on any of this, but it seems to me that the same facial reconstruction that was done on Richard III could be done on any of the skulls in the caskets although, with Richard, there was already a portrait of the king to use as reference. There appears to be real interest in this sort of thing at the moment, but the money to do it has to come from somewhere. I believe the authorities at Winchester are searching for funds to take the research forward, but I think their main focus, at least for now, is determining which bones belong to whom.